Project partners at the Kick off-meeting in Rovaniemi 22.-23.1.2019. Project partners at the Kick off-meeting in Rovaniemi 22.-23.1.2019. The two-day seminar was the first face to face -meeting with all partners. The seminar focused on the project’s activities already accomplished and on those to come. Presentations included e.g. Eeva-Kristiina Harlin’s talk about Sámi culture and archives, Tuomo Toljamo’s about technical solutions and Elina Luiro’s about the graphical guidelines of the project. 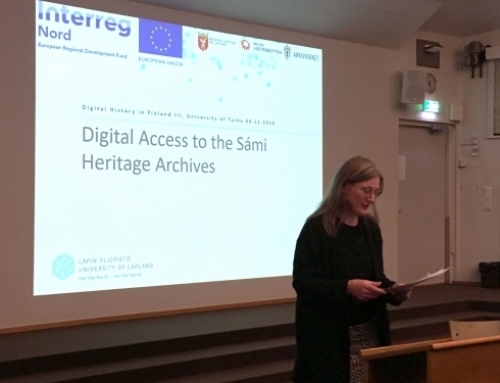 Digital Access to the Sámi Cultural Heritage consists of seven work-packages, each with several subtasks. Questions, wishes, ponderings, contacts, schedules… Here we go! See pictures from the Kick off on our Facebook page.